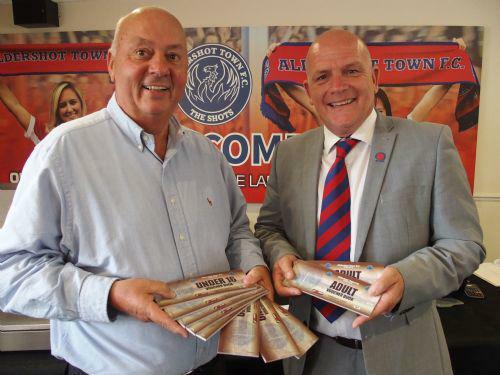 Our connection with Aldershot Town Football Club was strengthened this week as we renewed our Community Scheme tickets for the coming season. The tickets were handed over to Gordon by Mark Butler (Aldershot Community Manager) at the Wycombe Wanders pre season friendly match. Aldershot played very well in a 1:1 draw, let's hope that's a taste of things to come! The Abbey special school in Farnham will continue to use the tickets with their students and families. Gordon commented "The tickets have been a great success at The Abbey. Staff manage the allocation extremely well and literally hundreds of children and their families have enjoyed quality time together supporting our local team. We are delighted to be able to continue this project into another season."